My house has been in a state of CHAOS ("Can't Have Anyone Over Syndrome" according to FlyLady!) since we moved in over a year ago. We started renovations on our 40 year old bungalow before we even moved in and we have been at it ever since. Right now I have a missing cabinet in my kitchen where the dishwasher is supposed to be installed in the next couple of weeks and all the dishes that were stored in that cabinet are on the kitchen table. Sam's nursery is 95% complete...we just have to actually set up the crib once we find it in the storage locker we call the garage. Our newly developed basement looks great except for the masses of rubbermaid blue totes that need to be labelled and stored in our storage room...which still needs shelves. Sigh...it goes on and on and on! 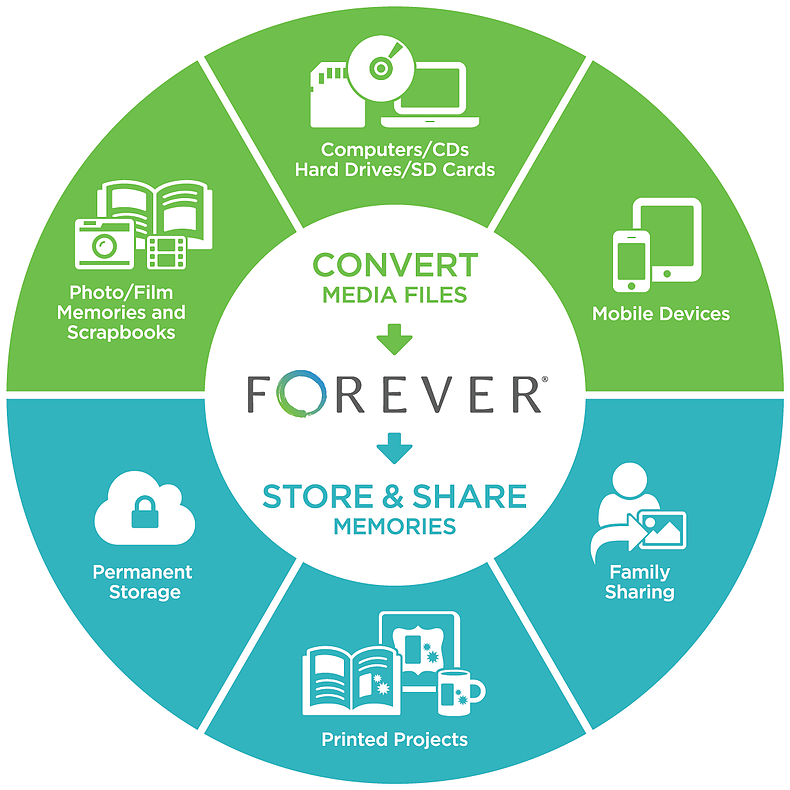 I am constantly thinking about storage and organization and how everything will look and function once I am done. I dream of having organized, color coded closets and shelves full of perfectly aligned matching rubbermaid totes with matching Dymo labels. In my scraproom I imagine finding a place for everything so it can be right at my fingertips...how many more layouts I could create! I am working towards that dream, but does anyone ever actually finish organizing? Or is it a constant ongoing project? But, I am happy to report that I have had sucess on TWO fronts! 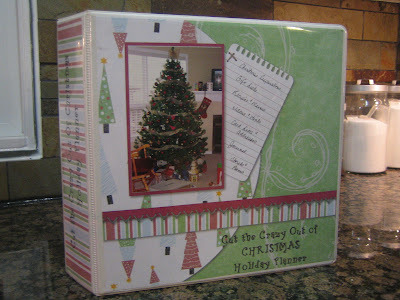 I have finished creating two organizational planners that will surely help me stay organized in other areas! 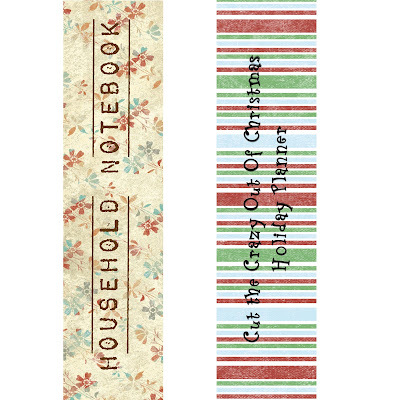 One is the Christmas Planner I was mentioning that I am making as part of a BPS class called "Cut the Crazy out of Christmas". 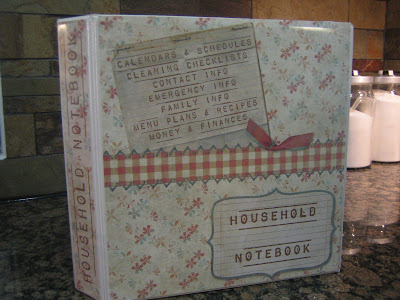 The other is a Household Notebook inspired by both FlyLady and Organized Home. I put the "guts" of each together over the last couple of days and then because I wanted them to look great sitting on my shelf or counter I stayed up way too late last night and created covers and spines for both using my digital scrapbooking program from CM - Storybook Creator Plus. I used a free digital kit from Shabby Princess called Holiday Magic for the artwork and LD Coffee House as the font on this. Because I didn't have a digital copy of the photo I wanted to use, the cover is actually more a hybrid project...I started by making a template, printed that out onto cardstock and then added the printed photo and journaling onto the cardstock. 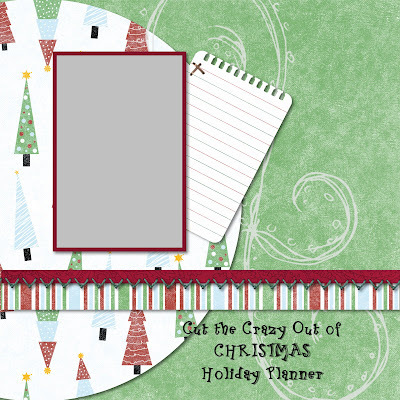 The inside of the Christmas planner has custom made dividers using artwork from the BPS class, and then I personalized it by stapling on strips of gingham ribbon along with the divider tabs. And here is my new household notebook! How sweet! 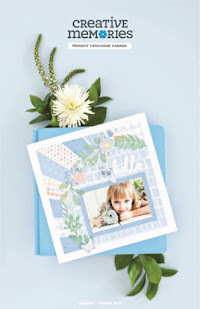 I used the Recipe Book Digital Kit from Creative Memories for this cover, and a font called LD Telegram. I love the vintage feeling they both have! 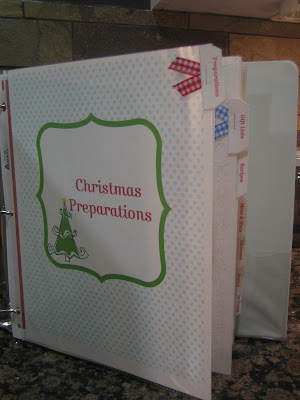 Inside I used ready made pocket dividers which will come in handy for slipping items into. I created both covers as 12x12 layouts in my Storybook Creator Plus program and then simply trimmed them down to fit inside the outer sleeves of each binder. Because I knew I would be trimming them I kept the majority of focus more towards the centre of each layout. I did the spines as two 3" x 12" strips, printed them both onto one sheet of cardstock and then trimmed them down to fit the side sleeves on each binder. On the whole I LOVE how they turned out and I think I will really be inspired to use them often! OK...only 978 more organizational projects to go! I love them, great job!